As the autumn finally starts to arrive here in Sydney, I find myself craving for warm soups and stews. I start my day with a bowl of warm oat porridge with chia seeds, grated apple, cinnamon and a splash of home-made almond milk, I eat a huge raw salad for lunch and a warm soup or a stew for dinner. 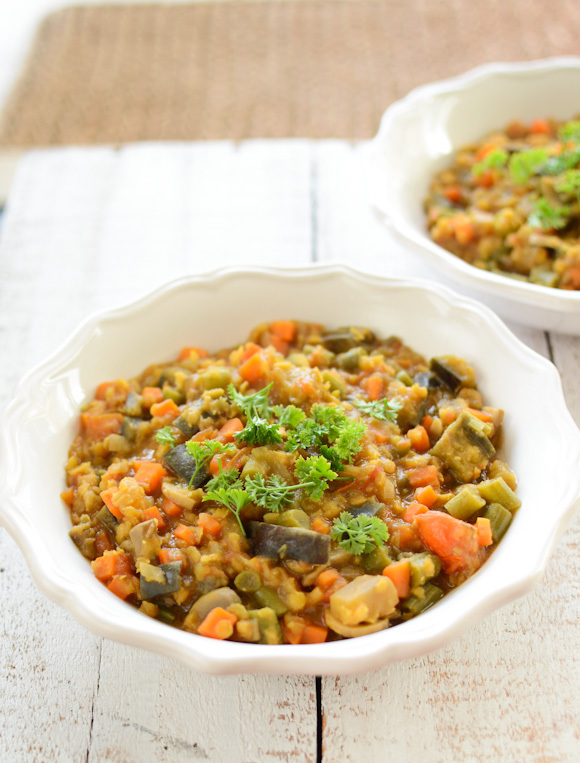 This Moroccan spiced vegetable and lentil stew is one of my recent favourites - the abundance of different vegetables and spices create a truly satisfying meal. 1. Heat olive oil in a large pan. Add onion, garlic, ginger and carrots. Cook for a few minutes, then add the spices and a splash of vegetable stock. Cook for a further few minutes. 2. Add the rest of the ingredients. Start with just 250ml of vegetable stock and add more when necessary during cooking. 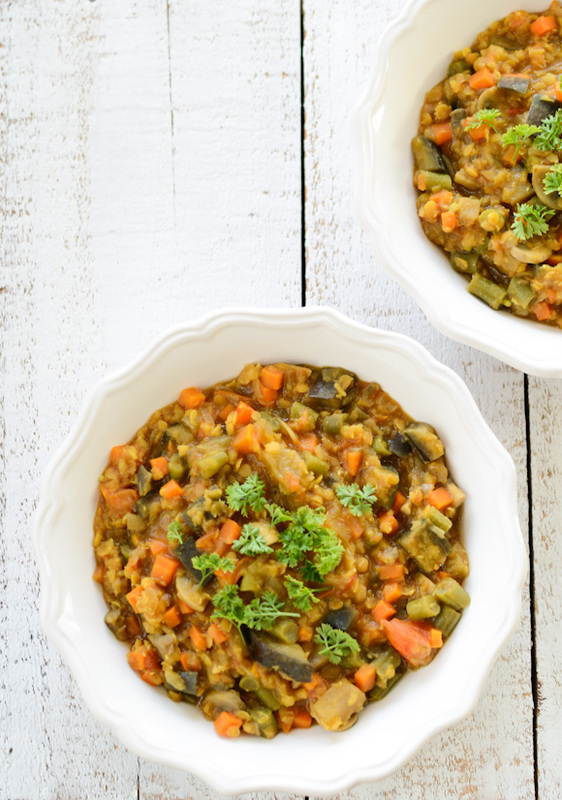 Cook the stew for 30-40 minutes or until all the vegetables and the lentils are fully cooked. Serve with a sprinkling of fresh parsley. I've got a nice vegetable soup on the boil at the moment, it's the rainfall tonight that's gotten me in the mood for some warmth! This looks delish too. ooho I love this combination! Very easy- delicious dish! Thanks for sharing! We have opposite seasons happening, but I may have to make this anyway! Look so hearty and delicious! Winter and Fall Root Vegetable Dishes are the BEST! We are seeing all the summer recipes coming out now here in the US so its so nice to have a fall favorite! I make a similar version all year round. I mix a handful of baby spinach through just before serving and top with natural yoghurt, sometimes a sprinkle of coconut. This is a staple in our household, particularly after a series of eating out. It's our 'rescue' remedy! Haven't tried it with eggplant, so will try that tonight. Perfect, thank you. I have all of those ingredients and a son with sore teeth. Nice a warm too as it is getting a bit cooler..
Looks good, am certain will taste fabulous! As I like to have my tastebuds tingling, shall be happy to add the spices . . .
Made this Saturday night and it has lasted me for days! Super healthy, super yummy. I LOVE your blog!